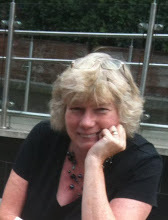 I’m very pleased to welcome back my friend and fellow Crooked Cat author Sue Barnard – who is also my editor! She is a lady of many talents and has a range of short stories, poems and three published novels to her credit. She wrote a great guest post for me a while ago about the role of the editor. Now, let’s hear a bit more about her writing and, in particular, her latest novel, The Unkindest Cut of All. Vanessa: Hi, Sue, and thanks for joining me on the chaise longue today. I understand you have been described as “professionally weird”. What’s behind that? Sue: Hi Vanessa, and thank you for inviting me back! “Professionally weird” dates back to the time some years ago when (for reasons which I won’t bore you with here) I first became involved in setting questions for BBC Radio 4’s fiendishly difficult Round Britain Quiz. It’s a quiz about connections. The questions have been compared to the knight’s move in chess (two along and one to the side), and require a particularly warped and weird kind of mind to devise and solve them. When I first received a modest payment for supplying some, my son pointed out that I was being paid for being weird – hence “professionally weird”. You’ve derived inspiration for two of your novels from the Bard of Avon – The Ghostly Father (Romeo and Juliet) and The Unkindest Cut of All (Julius Caesar). Have you any more up your sleeve? The Unkindest Cut of All is a murder mystery set in a theatre, during an am-dram production of Julius Caesar. I’ve drawn on my own love of the theatre to create the setting, though the characters (and the storyline) are pure fabrication. Once again I’ve borrowed from the Bard, as I did with The Ghostly Father, but this time I haven’t made any major changes to the plot! Tell us how you first came to be published with Crooked Cat Publishing. I first became involved with Crooked Cat as an editor (more about that anon). I’d recently completed an online editing and rewriting course, and I noticed that Crooked Cat were advertising on their Facebook page for new people to join their editorial team. I applied, and they were brave enough to take me on. A little further down the track I noticed that they were open for submissions, so I took my Dutch courage in both hands and sent them The Ghostly Father. The rest, as they say, is history. You have another incarnation, as an editor. In fact, you did a sterling job on my own novel. So who edits you and how does it feel to be on the other side of the fence? Thank you for your kind words – and believe me, you were an absolute delight to work with! Vanessa: blushes deeply. To answer your question, my latest novel was edited by Maureen Vincent-Northam. Mo and I worked very well together, and I also recently had the pleasure of editing her own book Trace Your Roots (Crooked Cat’s first non-fiction title). Another author once said to me that it was a treat to work with an editor who was also a writer. As someone who sees both sides of the process, I fully appreciate (perhaps more than a lot of writers) just how much effort goes into editing – in fact we’ve spoken about this on the chaise longue on a previous occasion – and I feel very grateful that someone is doing this for me. And I know that editors have feelings too – so on the very rare occasions when, as an author, I’ve disagreed with something that an editor has raised, I’ve always tried to raise the issue in a sensitive and tactful way. Two things, really. Firstly, that very few writers are lucky enough to make a fortune (or even a living) from writing. And secondly, I’ve been very surprised to find that almost all authors – including many big-name authors who are published by the bigger publishing houses – have to do a heck of a lot of their own publicity and promotion. This is an area where, sadly, modesty is no friend. And I’m always extremely grateful for kind friends like you who are prepared to host me on their blogs and help to spread the word! You write poetry and short stories as well as novels? Which do you prefer? That’s a tricky one, because I’m not really comparing like with like. I think poetry and short stories can be more satisfying in the sense that the writer can usually see results more quickly, but completing a full-length novel (and subsequently holding the published work in one’s hand) is immensely rewarding. At the moment I’m working (very slowly) on a time-slip novel based on an old French legend. I’ve also had an idea for a possible sequel to Nice Girls Don’t (my second novel), but so far that hasn’t progressed beyond the concept stage. What’s the nicest thing that’s happened to you as an author? In general, it’s being told by readers how much they’ve enjoyed my books. If I have to single out one particular thing, I think it will have to be the time when a friend who’d just read The Ghostly Father said to me, “Now I will never feel sad in Verona again.” I originally wrote the book as a personal project, to give myself the hope that the story of Romeo & Juliet might have had a better outcome. It means an awful lot to me to think that as a direct result of something I wrote, someone else now feels the same way. Thank you for joining me today, Sue. Thank you for inviting me, Vanessa. It’s been a pleasure. Copyright © Sue Barnard, Vanessa Couchman 2015. All rights reserved. This entry was posted in Author interviews, Fiction, Novels and tagged author interview, Crooked Cat Publishing, fiction, Nice Girls Don't, Novel, Sue Barnard, The Ghostly Father, The Unkindest Cut of All by nessafrance. Bookmark the permalink. I first found out about Sue’s writing when I won a copy of Nice Girls Don’t – a book I really enjoyed. I love the fact that she sees life from the vantage point of author as well as editor yet remains very approachable. Good luck for the future, Sue! Thanks for your comment, Marilyn. I’m sure Sue will be delighted to know this. Thank you, Vanessa, for giving me the opportunity to know more about Sue. I’ve read her books, ‘The Ghostly Father’ and ‘The Unkindest Cut’ and enjoyed both of them; both drawn from Shakespeare but very different and clever. I like to get to know about authors and to know that the struggles I have are shared by everyone else to a greater or lesser degree. Thank you, Jeanette, I will pass on your kind words to Sue. Yes, we all struggle in pretty much the same way!